Cortana can launch a program or open a website. (Say "Launch Quickbooks" or "Open Amazon.com".) It can make a phone call, read the news headlines, send an email or text message, and other useful actions. 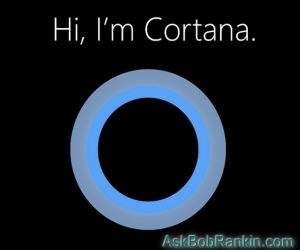 Here is an extensive list of commands that Cortana can recognize, courtesy of Cnet. Cortana can also set reminders of important dates, appointments, and so on. Location-based reminders let you set a reminder associated with a location, such as the grocery store. When you go there, Cortana will (for example) remind you that you need to buy eggs and milk. It can retrieve from the Internet weather reports, sports scores, news about a specific topic, Wikipedia articles, and more. It can remember your interests in music, sports teams, etc., and notify you when your favorite bands are coming to town or remind you of the next home game. Cortana can integrate with other apps from Microsoft and third-party developers. Skype, for instance, has several Cortana “bots” or third-party apps that perform specific tasks using specific services, e. g., buying on eBay, booking a flight on Expedia. Cortana can also call or text any of your contacts stored in Windows 10’s People database. To see what third-party apps are integrated with Cortana, click anywhere in the Search box. Then click on the Notebook icon (third from top). Then find and open the Skills section. One of the big concerns about Cortana is that it stores a lot of data about your computing activity, including emails, browsing history, and search history. But guess what? Cortana only has access to these things if you use Windows 10 apps for them! If you use a browser other than Edge or Internet Explorer, your browsing history won’t be stored by Cortana. If you don’t use Bing, your search history is safe. If you use Webmail other than Outlook.com, your email won’t be scanned by Cortana. Using non-Microsoft apps for calendar and contact data protects those types of data from Cortana. Another way to avoid feeding your activity to Cortana is to eschew a Microsoft account, because Cortana stores your activity in cloud storage assigned to a Microsoft account. Of course, the less Cortana knows about you, the less helpful it is. If you would rather just disable Cortana completely, here is simple way to do it no matter what version of Windows you may have. Just click here to download a Zip file containing two registry hacks created by HowToGeek.com. Inside the Zip file are two registry hack files, one to disable Cortana and one to enable it. Open the zip file after downloading, and double-click the “Disable Cortana.reg” file. After executing a registry hack, you’ll need to reboot before it will take effect. In case you're wondering, Microsoft borrowed the Cortana name from their Halo video game. In the game, Cortana is an alluring artificially intelligent female character. The voice actor from Halo also voices the Cortana digital assistant. The word "cortana" also refers to a type of sword known as a “sword of mercy.” So make of that what you will. Most recent comments on "[Windows 10 Tip #4] - Cortana: Friend or Foe?" I'm of an age where they would put me away if I was caught talking to my computer without swearing at it! I was disappointed I couldn't get Cortana to work. Now, I'm relieved. Thanks, Bob! I found cortana to be a distraction, and turned it off after about 10 minutes of my first Win 10 install. I don't use siri on my work phone either. From my perspective, Cortana, Siri, Echo, Alexa and their imitators require me to share far too much personal information in return for the benefits they provide. I simply don't trust them to keep that information secure. I have never used it with my two Windows 10 computers, and see no reason to change that. I found Cortana to be less than useful. I use Search Everything if I want to locate something on my PC. I have disabled Cortana by renaming the Cortana SearchUI. This way, it is not only turned off, it doesn't run in the background either. IT IS A NUISANCE!! I have disabled Cortana (I think) and I want to get rid of it permanently! I do not like talking to the computer because I'm normally in an enclosed space with people all around when a laptop is open. I use Siri extensively on my phone because talking to a phone seems natural. Maybe if I wore a headset when on the laptop, but I don't. Well, I guess I am in the minority here, but I love Cortana. I especially love the reminder function, and find it very useful for everything from "to do" lists, to reminding me to give my cat his medication twice a day. I use Chrome, not Edge as my browser, and gmail, not outlook for email, so am not concerned about privacy issues with Cortana. Honestly, it's like everything else in the digital world....once you try it for a while and get used to it, you wonder how you ever managed without it. Every time I decide to "look again" at Cortana. I end up wasting time & getting nowhere. I am sick to the teeth of every question directed at Cortana resulting in Edge being launched. If I wanted an internet search I would have initiated one in a familiar browser. Cortana can usually find nothing I'm looking for on my PC, it wants to go right to the web. I usually end up going to the search box in my file folder which works pretty good. Why can't MS just make an OS that runs the OS and maybe a nice UI. If I need other garbage, is this not what the Store is for? I turned off Cortana as fast as I figured out how and actually set up my computer with a non microsoft user account. The only reason my admin was MS was to use the store. Really wish they'd make something that's not "easier" and more "intuitive" so that I would still know how to use it. "Cortana, go over in a corner and die!" Cortana is an annoyance. I'd much rather type what I want into a search box and modify it if I have to, before or after the first search. It's ok for very simple tasks, but not worth enough to get used to using it. i've had some luck finding files, but don't ever ask her anything about your computer, she just sends you to an internet search page! Not only turn Cortana off, but go into settings and switch off the microphone, it's easy to turn back on again for Skype or whatever. You should do the same with your camera, and put a piece of tape over the lens, that's what Zuckerberg does and there's a reason for it! Don't bother using the Edge browser either, at least until they've sorted out the problems. For voice searching the internet, pick up your Android phone and use that, once it gets used to your voice it's extremely accurate. Thank you! Cortana reminds me of Medusa - that Greek entity with the head made of snakes! I disabled Cortana, removed Microsoft Edge, disabled Bing, and avoid IE. There seems to be way to much intrusiveness out there. I simply don't trust those big companies out there that handle loads of personal, private, and public information, and it is way to easy for that to slip into the hands of hucksters, scammers, and spammers for nefarious and fraudulent practices.